We have just had confirmation that our dw Compass app has been approved for release in Apple’s app store. We designed this to be a simple but ultimately useful tool for the outdoor enthusiast with an iPhone. 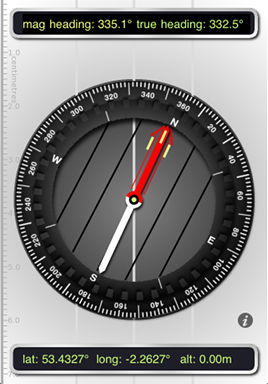 The dw Compass app makes use of the in built gps and compass features in the iPhone3gs and iPhone4 to give the user the latitude and longitude coordinates of their current position as well as their altitude and heading. The declination (the difference between magnetic and true north) for the user’s current location is set automatically within the app. Check back here for news and any future upgrades.